General Description of Microphthalmia Transcription Factor. MITF (microphthalmia transcription factor) is a basic helix-loop-helix-leucine-zipper (bHLH-Zip) transcription factor that regulates the development, survival of melanocytes, retinal pigment epithelium,, also is involved in transcription of pigmentation enzyme genes such as tyrosinase TRP1, TRP2. MITF has been shown to be phosphorylated by MAP kinase in response to c-kit activation, resulting in upregulation of MITF transcriptional activity. Mutations of the MITF gene are associated with the autosomal dominant hereditary deafness, pigmentation condition, Waardenburg Syndrome type 2A. Multiple isoforms of MITF exist, including MITF-A, MITF-B, MITF-C, MITF-H,, MITF-M, which differ in the amino-terminal domain, in their expression patterns. The MITF-M isoform is restricted to the melanocyte cell lineage. 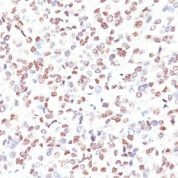 Anti-MITF, D5, recognizes a nuclear protein, which is expressed in the majority of primary, metastatic epithelioid malignant melanomas as well as in normal melanocytes, benign nevi, dysplastic nevi. Tested Applications: Flow Cytometry, Immunofluorescence, Immunohistochemistry (IHC). Buffer and Stabilizer: 10mM PBS with 0.05% BSA & 0.05% azide. 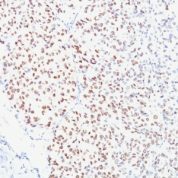 Variations in Microphthalmia Transcription Factor antibody staining intensity in immunohistochemistry on tissue sections are present across different anatomical locations. An intense signal was observed in melanocytes in skin. More moderate antibody staining intensity was present in melanocytes in skin. Low, but measureable presence of Microphthalmia Transcription Factor could be seen in cells in the tubules in kidney, germinal center cells in the tonsil, glandular cells in the epididymis and stomach, hematopoietic cells in the bone marrow, lymphoid tissue in appendix, macrophages in lung, non-germinal center cells in the lymph node and tonsil and smooth muscle cells in the smooth muscle. We were unable to detect Microphthalmia Transcription Factor in other tissues. Disease states, inflammation, and other physiological changes can have a substantial impact on antibody staining patterns. These measurements were all taken in tissues deemed normal or from patients without known disease. 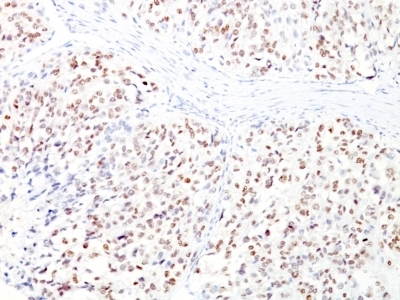 Tissues from cancer patients, for instance, have their own distinct pattern of Microphthalmia Transcription Factor expression as measured by anti-Microphthalmia Transcription Factor antibody immunohistochemical staining. The average level of expression by tumor is summarized in the table below. The variability row represents patient to patient variability in IHC staining. enQuire Bio's Microphthalmia Transcription Factor Anti-Human Monoclonal is available for Research Use Only. This antibody is guaranteed to work for a period of two years when properly stored.